Stay on the beach at our Ramada Plaza Nags Head Oceanfront Hotel. 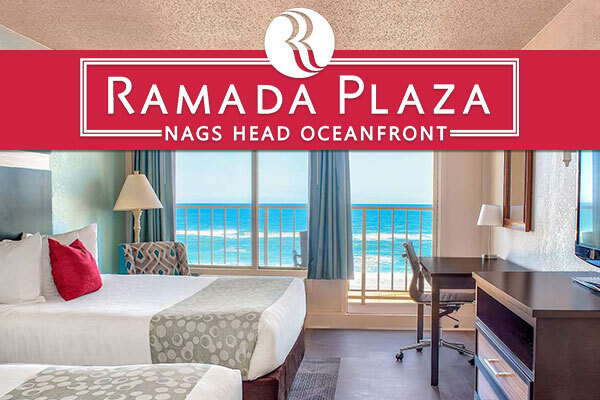 The Ramada Plaza Nags Head Hotel is the ideal Outer Banks hotel for a relaxing getaway. Located right on the beach in Kill Devil Hills, we offer 171 oceanfront rooms with views of the city, the dunes or the ocean. Each room has its own private balcony, microwave, fridge, coffee maker and FREE Wireless High speed access. Our deck overlooks the ocean and surround our indoor heated pool and Jacuzzi that you can enjoy any time of year! You can also work out in our fitness center, equipped with cardio machines, free weights and a weight station. A standout hotel in Nags Head, Ramada Plaza's beach is ready for relaxation with beach chairs and umbrellas available. Enjoy breakfast, lunch (in season) or dinner at Peppercorns restaurant and lounge located onsite. Don't miss live entertainment on Friday and Saturday evenings!